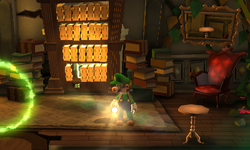 The Study is a room in the Treacherous Mansion in Luigi's Mansion: Dark Moon. It is located on the second floor and can be accessed from the East Corridor. It is a small room with stacks of books scattered around, as well as a chair and two Bulbs. The main feature is the large bookcase in the middle that contains a hidden passage to the Train Exhibit. During A Train to Catch, Luigi needs to come here to get to the Train Exhibit where Mario is being held. The book to open the passage can be seen in a mirror, and needs to be uncovered with the Dark-Light Device. However, once Luigi puts it in the bookcase, the Strong Poltergeist pushes it out and steals it. He must then go to the Space Exhibit and recover it. The book can only be brought back in by flipping the wall of the Nautical Exhibit to bring the E-Gate into the room, activating it, and passing through the Front Entrance via the E-Gate in the Space Exhibit. This page was last edited on September 24, 2017, at 03:58.